The activists, demonstrating at the Olympic countdown clock in St. Petersburg, were quickly cited by police officers. A pair of Russian activists with the group Straight Alliance for LGBT Equality held a brief demonstration at the Olympic countdown clock in St. Petersburg Wednesday, comparing this month's Winter Games in Sochi with the 1936 games held in Nazi Germany. 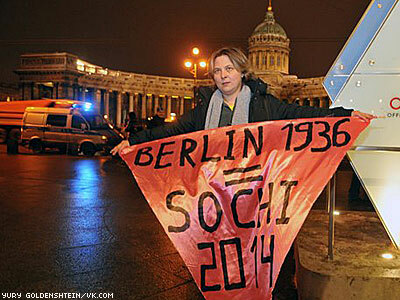 The demonstration, which saw activists unfurl banners in the shape of pink triangles emblazoned with the text "Berlin 1936 = Sochi 2014," was originally scheduled to take place on two platforms inside the St. Petersburg Metro, but police reportedly learned of the protest and detained several activists before the demonstration even began. In response, members of the Straight Alliance for LGBT Equality shifted gears, and approached the Olympic countdown clock in central St. Petersburg. At approximately 8 p.m. local time, Alliance members Natalia Tsymbalova and Mikhail Gerasimov staged single pickets, holding up their banners as photographers and activists captured the demonstration. The Straight Alliance for LGBT Equality reports that there was a sizable police presence on hand during the demonstration, and that officers took down the names and information of the two Russians who held banners. In a statement released with photos and videos of the event (see video below), the Alliance made explicit the connection it sees between the 1936 Berlin Olympics, held under Adolf Hitler, and this winter's Sochi Olympics, held in a nation that has criminalized discussion or acknowledgement of LGBT identities as so-called gay propaganda. "President Putin has managed to convince the [International Olympic Committee] that in Sochi athletes would not be discriminated against on grounds of sexual orientation," reads the release. "However, the whole world knows that the Russian government is following undisguised homophobic policies… LGBT people are being denied the right to freedom of speech and assembly, and the right to protection of their human dignity. Putin has offered assurances that there will be no discrimination at the Olympics. But once the Olympics are over and the athletes have left Russia, what will be the plight of Russian LGBT people then? There will be the same, or even stronger, homophobia by politicians, legislators, state-owned media and neo-Nazi groups." The Straight Alliance, which has been vocal in its condemnation of Russia's draconian anti-LGBT laws, closed its statement with a call to action. "On the eve of the Sochi Olympiad LGBT activists both in Russia and around the world call on all Olympic athletes, sponsors and Olympic guests to utilize their opportunities to issue statements in support of equality for LGBT people, to come out against homophobia and intolerance, and to lobby for the repeal of discriminatory anti-gay laws in Russia," reads the statement. Watch the Alliance's video of the demonstration below, and see additional photos here.